The Catholic Filipino Chaplaincy traces its early beginnings in 1988 when then Archbishop of Brisbane, Most Rev. Francis Rush, appointed Sr Necitas Esguerra, fdcc to minister to the Filipino community in the Brisbane Archdiocese. Sister Necitas, a Canossian, later formed an Interim Committee with the support and guidance of Fr Paul Byrne. For three years (from 1989), Sister Velia Cristine SSpS ministered to the Filipinos living in the north of Brisbane while Sr Necy concentrated on those living in the south – When Sr Velia left, Sr Necy provided pastoral care to the Community until 1996 when Father Dominador Flores SVD was appointed the Community’s full time Chaplain. Other priests and religious sisters also assisted in meeting the ever increasing needs of the Community including Father Norman Pena SSP, Father Adrian Tapiador SJ and many others. Father Dom finished his term in 2001. Subsequent Chaplains were Father Ben Macajes SVD (2001 – 2003), Father Marcelino Singson (2005 to 2014) and Father Terence Nueva (2015 – 2106). Following consultations with the Archbishop, Fr Terry and the Filipino lay leadership, and with the premise that ‘Filipinos are now well integrated and in their respective parishes’, a decision was made in early 2017 to discontinue the Filipino Chaplaincy. While Fr Terry Nueva who is currently parish priest of Our Lady of Fatima in Acacia Ridge, ceases to be the official Chaplain, annual Filipino religious events continue across the archdiocese with the support of Mass celebrants — currently Fr Terry Nueva (Parish Priest of Acacia Ridge), Fr Marce Singson (Parish Priest of St Edward the Confessor Daisy Hill), Fr Nestor Candado SSP (Manager of St Paul’s Book Centre, Fr Severino Bustamante OFM Cap (Parish Priest of Gurdian Angels Wynum) and Fr Saldie Resolado OSA (Associate Pastor of Coorparoo St James). 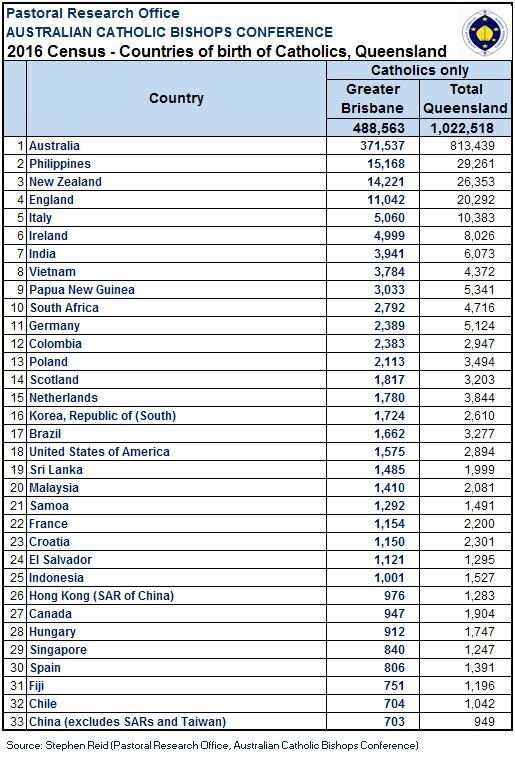 ABS 2016 Census preliminary estimates show that in Queensland, Filipinos form the largest group in the category ‘Catholics by Country of Birth’ (non-English-speaking background NESB).